Customer traits are pieces of information about a customer, like their plan, number of licenses, name, etc. that are defined by you or the systems, like Segment, that you integrate with. You can view a customer's traits on their dashboard, setup subscription tracking based on traits, use them for sorting and filtering, or even define Success Metrics using numeric traits. In the Traits view for a customer, you can see all the currently defined trait values for that customer. Traits are separated by their source: Custom traits are traits defined in Vitally, and traits from each of your integrations (e.g. Segment, Stripe, Mixpanel, etc.) are visible on their own tabs. Both custom traits and traits from your integrations can be edited. Just click into the field for that trait, change the value, and hit save to save your changes when you're done editing! You can create a custom trait directly from the customer's traits view by selecting Create a trait in Actions. After naming and selecting a type for your new trait, you can add a value for that specific customer. If you've configured your Segment integration to send group calls back to Vitally, editing a trait will cause Vitally to immediately send those updates to Segment. Warning: Be cautious when editing traits from other integrations. They may overwrite traits in other systems, or be overwritten themselves the next time Vitally receives data from that integration. Each trait in Vitally has a source, a name, a type, and a status. You can manage the attributes of your traits and create new custom traits in the Traits section of your Account Settings. You can create new traits in Vitally to store data that is not contained in other systems. This might be the last date you contacted the customer, the name of an important stakeholder, or a brief description of the customer relationship. Traits that are created and managed in Vitally are called Custom Traits. You can automatically set a custom trait's value using Rules. 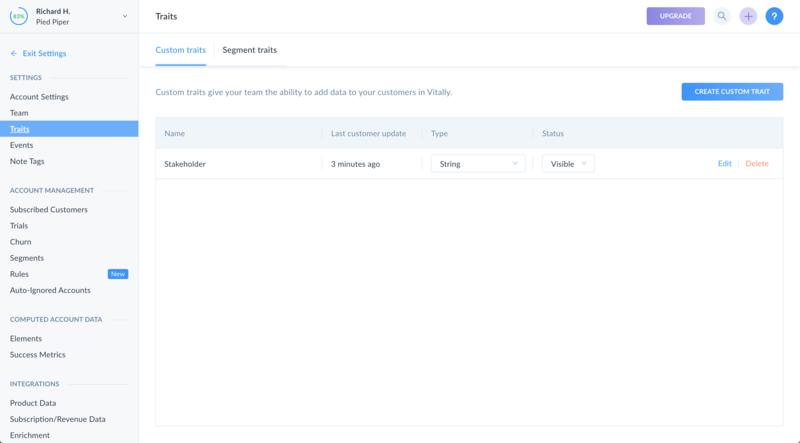 When Vitally receives traits from your connected integrations, like Segment, Mixpanel, Stripe, and Clearbit. You can change the type or of these traits, but you cannot edit their name as the name is owned by the integration. You can also delete traits from integrations. But, if the integration sends it again, the trait will be re-created in Vitally. If you want the trait to not be visible even if it is seen again, set its status to Hidden. Visible: The default state. We'll show these traits normally. Hidden: Hidden traits will not be shown in Vitally. Use this when you receive traits from an integration that you don't care about seeing in Vitally. Pinned: Pinned traits will be shown at the top of your trait lists. Use pinned traits to prioritize the traits you look at frequently.